Humankind in the state of most trying would never know what this realm has to offer. It is the secrets that are not to be touched are made by a power that cannot be described nor challenged but felt. 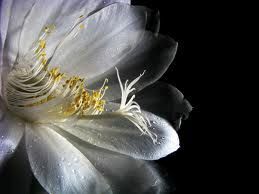 It was the creator who is named after this Queen of Night, Lotus “Brahman Kamal.” Believed to bring fortune at one’s doorsteps with prosperity, the rare bud is found only hanging on the slopes of Himalayas. Brahma Kamal native to Uttarakhand, India, northern Burma and southwest China is also known as Saussurea Obvallata, it has 31 varieties learned by Botanist, blooming between July and September each year, commencing after the sun goes down from 7 pm taking a couple of hours to reveal its enchanting gift by the Lords, showing a white stamen believed to represent Lord Krishna, while the brown stalks represent 100 Kauravas from the Mahabharata. It is reckoned that the revival of Lakshmana using Sanjeevani the Gods showered Brahma Kamal from heaven in a celebration which took root in the valley of flowers, the reason of it blooming once a year. Given the status of a life-restoring flower, it has numerous medicinal properties. Tales have it, Brahma emerged from Vishnu’s navel in a lotus flower. Hence the one year blooming. The shimmering flower came into notice by Draupadi when accompanying, the Pandavas when exiled in the forests, recollecting the grievous memories in the Kaurava court, one evening spectating a lotus bloom, feeling indescribably spiritually contented but withering as quickly as it had blossomed. The flower chooses to bloom in a house by its own, and a spectacular view witnessed rarely. If luck fancies you, then a glance of the flower of Lord Brahma would fancy your fortune, protecting its owner from evil powers fulls filing all its desires if gifted by someone and not purchased. A writer by Heart, Hippie by Soul, Vagabond by Fantasy. Add These Nutrient Rich Edible Seeds In Your Diet Today! Pop-Top For Beer Cans: The Unsung Invention Of The 20th Century You Never Knew About!